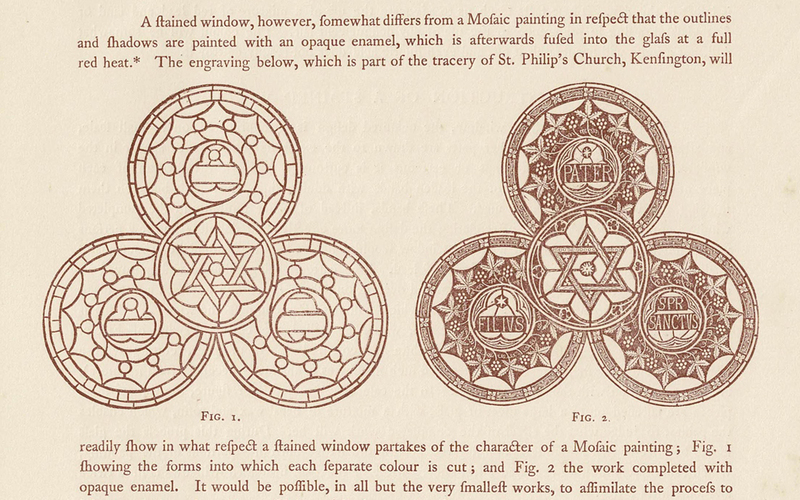 In this section we'll feature articles on historic stained glass. The Journal of Stained Glass has a rich variety of articles on all aspects of historic stained glass and you can use the JSG search feature here. The revival of stained glass in the 19th century led to a fascinating quest to recreate and improve the raw material of coloured glass itself. 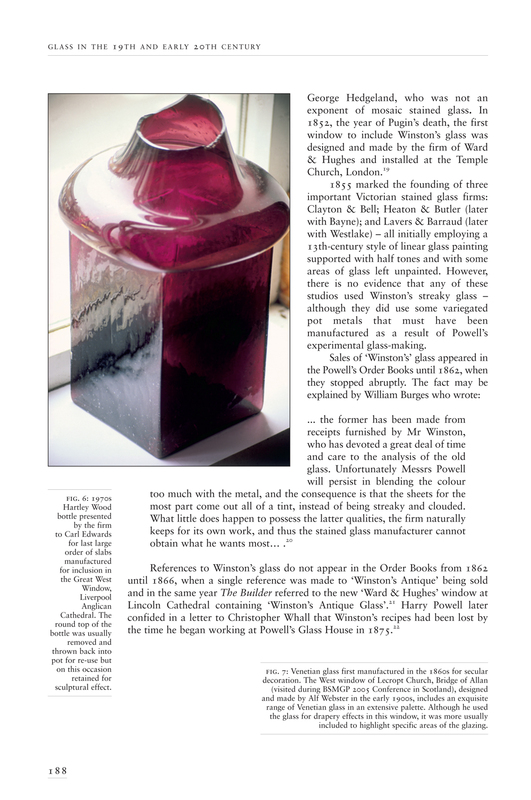 From our Library housed in the Society of Antiquaries of London, we bring you an enlightening article from our 1934 Journal revealing how glass was manufactured in the 19th century. And it touches on Mr Clayton and Mr Bell! 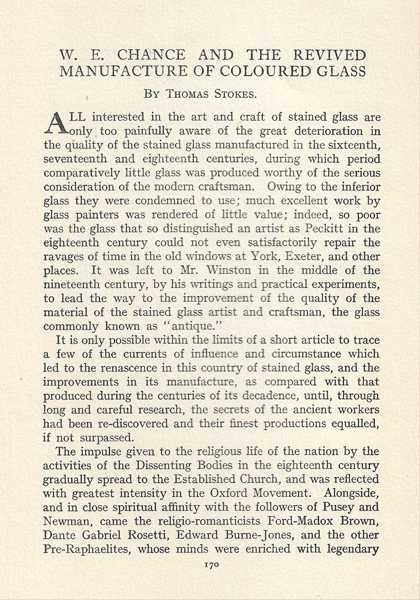 You can download the article here (PDF 15mb) W. E. Chance and the Revived Manufacture of Coloured Glass by Thomas Stokes. Have you ever wondered about the remarkable glass used in Arts & Crafts windows? From a more recent issue of The Journal of Stained Glass published 70 years later is Tony Benyon’s article exploring ‘The Development of Antique and other Glasses used in 19th- and 20th-Century Stained Glass’, beautifully illustrated with samples including kelp glass, Prior’s ‘Early English’ slabs, ‘Venetian’ glass, Powell’s ‘Pressed Slab’, a Hartley Wood slab bottle and much more from the remarkable collection of the Benyon Studio (PDF 7mb). 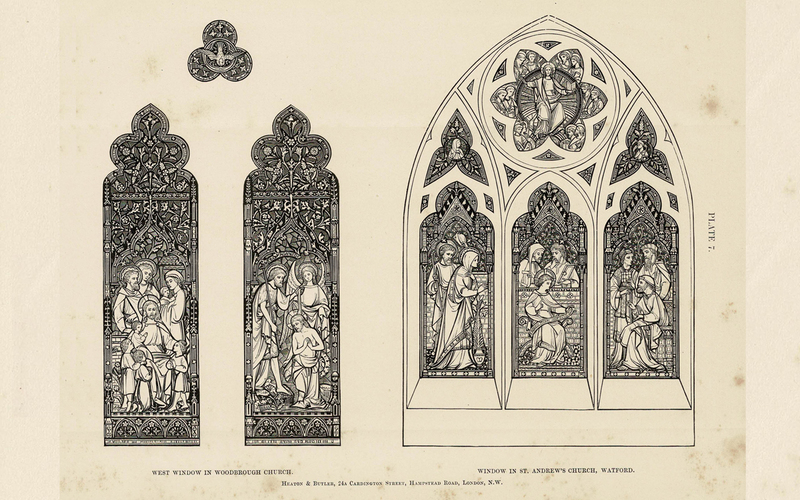 In 1925 the American stained glass artist Charles J. Connick contributed an article to our Journal which had been published that same year in The New York Times. He describes the ‘spirit of playful adventure’ witnessed at l’Exposition Internationale des Arts Décoratifs et Industriels Modernes in Paris, now famed for the emergence of Art Deco. Modern Stained Glass at the Paris Exhibition, 1925 (PDF 11mb). 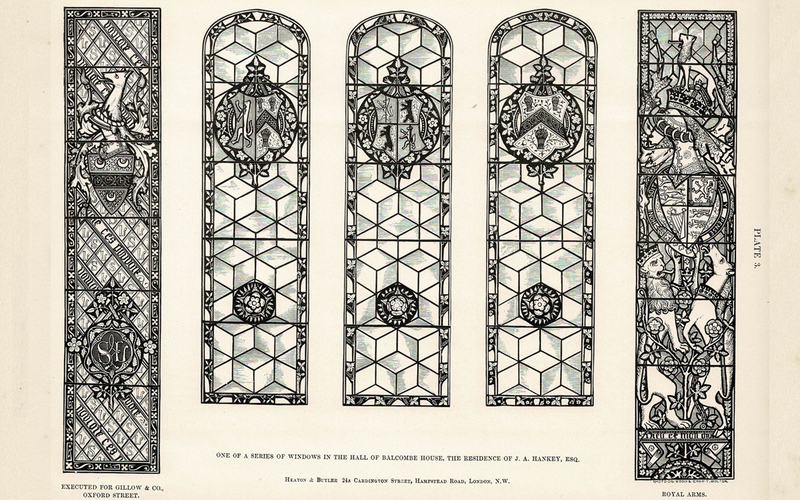 The Illustrated Catalogue of Stained Glass Windows by Heaton & Butler (PDF 30mb). When you have got used to reading the f’s as s’s this makes a fascinating and insightful read! A number of large and ubiquitous stained glass firms were set up during the Victorian era, coinciding with the upsurge of church building and church restoration. Among the most successful were: Burlison & Grylls; Clayton & Bell; John Hardman & Co.; Heaton, Butler & Bayne; Kempe & Co.; Lavers, Barraud &amp Westlake; James Powell & Sons, Whitefriars; Shrigley & Hunt; William Wailes; Ward & Hughes; and William Warrington. Many were the result of moves between firms by individual designers and makers until settled partnerships emerged. We are fortunate to have in our Library a copy of a Heaton & Butler catalogue. Heaton had joined Butler in 1855 and Bayne entered the firm in 1862, so the undated catalogue must have been produced between those dates. This fascinating document not only gives a history of stained glass of the era, but also describes the whole process of making and installing a stained glass window. Included is a comprehensive price list, cross referenced to ten plates showing different components. Prices ranged from 2 shillings a square foot to £2. 2/- for a complex window. To put that in context, the Wages Books of James Powell & Sons of the Whitefriars Glass Works of a few years later show the weekly wage of the average worker as £1. 10/-, or about 7 pence an hour. That compares with the 2019 minimum wage of £8.21 per hour.